The Christian Science periodicals - the Journal, Sentinel and Herald - have been providing inspiration and accounts of healing for decades. In them you will find topical articles, commentary on the bible and our weekly lesson sermon, accounts of healing and regeneration, and general information about Christian Science. 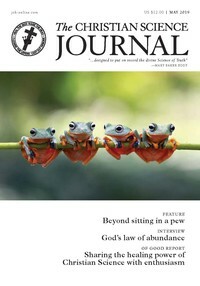 The Journal also has a comprehensive directory of Christian Science churches, societies, practitioners and nurses. There is an archive of every article ever published in the periodicals, but you will need to subscribe to JSH Online to read them. Just follow the Search links below. 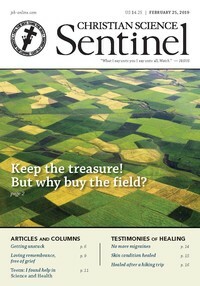 The Sentnel was published in 1899 as the Christian Science Weekly. You can search an archive of all the articles and testimonies ever published. 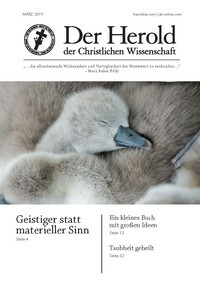 The first edition of The Herald of Christian Science was published in German in 1903 “to proclaim the universal activity and availability of Truth.” Today print editions of the Herald appear in German, French, Spanish, and Portuguese, while online the Herald now posts video testimonies, audios, and written material in more than 24 languages. Readers and contributors from around the world bear witness to the universality of Truth.